This immunity boosting tea, along with Nettle Infusions and a healthy diet, helped me through cold and flu season and has kept me enjoying life all year long. Learning how to boost your immune system before it’s too late can be the most powerful tool in your life. Reducing our “dis”eases , aches, pains, or any other kind of sickness should be a priority in our lives. When we are healthy we can do the things we love more often! We perform our best when we feel our best. These homemade teas are all easy natural ways to improve immunity. Echinacea is well known for it effectiveness in reducing symptoms of a common cold and other respiratory infections by purifying the blood. When an herb can do something as magnificent as purify the blood you better believe that it works for more than just a cold. Traditionally it was used for snake bites, spider bites and other poisonous animal bites but now we have realized it can be used for cuts, acne, general diseases like bronchitis and it’s also effective in soothing a sore throat. I also learned that it is cultivated all throughout the US. I think I might try to grow some because not only is the root extremely beneficial it makes as a pretty ornamental flower too. Oh how I love nature! You can buy either Echinacea angustifolia or purpurea which are the scientific names. You can buy all these herbs either at your local herb shop, local health market or online at Mountain Rose Herbs. They have the highest quality herbs, spices, and essential oils! 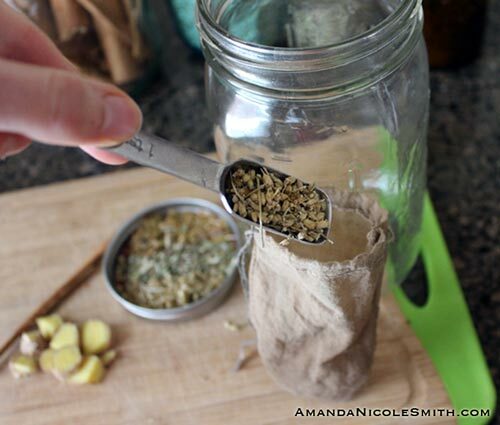 Yarrow is another herb I use as an immunity booster during cold and flu season. The Native Americans made great use of yarrow using it to induce sweating to reduce fever associated with the common cold. They also pounded the stalks, making a pulp to topically apply on swelling and bruising. Yarrow is what they call a blood regulator meaning it helps with menstrual pains and stomach discomfort. I wonder if I could find this growing wild in the woods. You would be surprised at how many beneficial herbs grown wild all around the US and this one in particular grows wild in the Northern hemisphere! There are so many benefits of ginkgo biloba it would be difficult to list them all. This is mainly due to it being one the longest living species in the world. It is well known for it’s effect on the brain. Ginkgo is said to bring more blood flow to the brain thus it is good for increasing concentration and memory. It’s good for all kinds of thinking disorders and can also help alleviate headaches and the symptoms of depression. Ginkgo is all about improving blood circulation which can help the eyes, ears and outer limbs. If you’re like me and get cold hands and feet especially in the winter time ginkgo should help out a lot. I have definitely noticed my brain function improve by drinking this along with yarrow and echinacea in the morning before work. 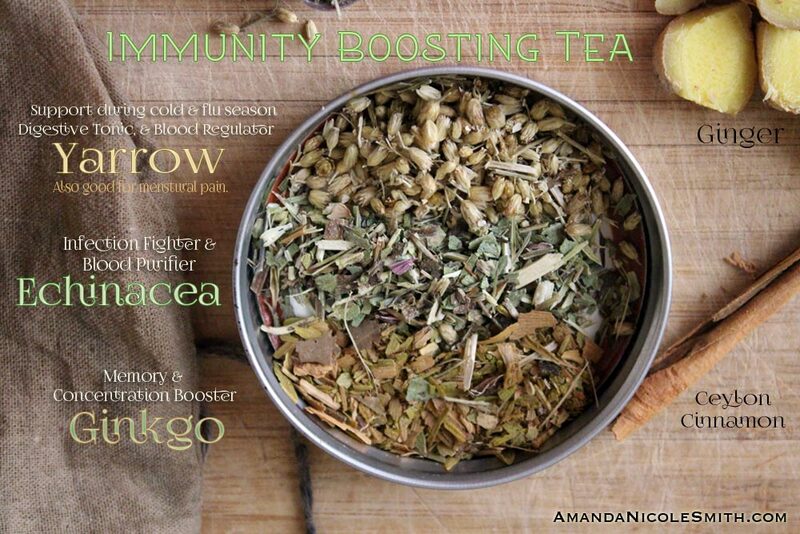 I have concocted a tea that not only tastes good but also has herbal immunity boosters! I have been using plants, herbs, spices and food as alternative medicine for about 4 years now, Echinacea has been in my box of tricks for infections of all kinds. Yarrow and Gingko have introduced themselves to me just a few weeks ago. When I put them all together they created a nice mellow tea. The yarrow and Ginkgo hid the astringency of echinacea, adding warm undertones. I also add a bit of ginger and sometimes a little piece of ceylon cinnamon to sweeten and spice it up a bit. It’s my perfect winter morning tea, warms me from the inside out, cures me of illness, boosts my concentration and brain power and makes me overall feel really good. The perfect homemade winter tea. I make my tea in a qt sized mason jar so I can take it with me on cold winter days as a hand warmer. But you should let it cool for at least 30 minutes before touching it. It lasts me all morning! You can re-steep the same tea bag twice. I must note that I am not on any medications. 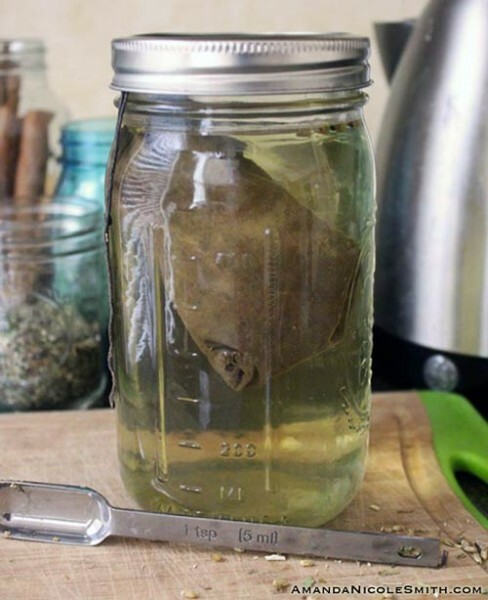 Herbs can react with medicines and so if you are on any drug at all or if you are pregnant please consult your physician before trying this tea. Be safe, happy and healthy! Find Echinacea, Yarrow, and Gingko Biloba at your local herb store, health market or online at Mountain Rose Herbs. Thank you for posting this recipe, Amanda! You inspired me to try nettles, and now I’m hooked, so I will be sure to give this herbal blend a try. After I drink nettle tea, I feel like my sinuses are wonderfully balanced (though I haven’t been sick when I have consumed nettles and I don’t really have sinus problems) and I even think that my athletic performance is enhanced to a small degree. Good stuff!